Forget what your science books say about helium. Noble gases—helium, neon, argon, krypton, xenon, and radon—have long been believed to be the least reactive elements on the periodic table. Helium’s composition in particular, with its full outer electron shell, makes it theoretically unable to interact with other atoms to form a stable compound. So while other noble gases like xenon, krypton, and radon have successfully reacted to create compounds under extreme pressure, helium has thus far been incapable. 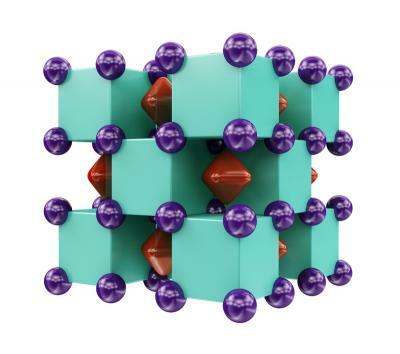 However, despite the assumed impossibility, a team of international scientists has recently created a stable helium-sodium compound. In previous attempts of pairing helium with other elements, results have always been fleeting. Helium’s closed shell configuration makes it difficult, if not downright impossible, for the element bond with other atoms. But this restriction is tied to the assumption that conditions are the same or similar to those on Earth’s surface. In outer space, it’s very possible that helium’s ability to react is very different given the change in environment. “[E]xtremely high pressure, like that found at Earth’s core or giant neighbours, completely alters helium’s chemistry,” adds Utah State researcher, Alex Boldyrev told Phys.org. To test this theory, the team used a ‘crystal structure predicting’ computer model in which they could observe how helium would react under extreme pressure. By exposing helium and sodium to atmospheric pressure 1.1 million times more than Earth’s, they were able to create the compound Na2He. This compound, along with breaking the rules of Helium’s reactivity, it also didn’t bond in a typical way. The cubic arrangement of alternating sodium and helium atoms isn’t held together by chemical bonds. According to Boldyrev, “…when we performed chemical bonding analysis of these structures, we found each ’empty’ cube actually contained an eight-center, two-electron bond… This bond is what’s responsible for the stability of this enchanting compound.” Helium changes the interaction between sodium atoms so much that if it is removed, the entire structure becomes unstable. Because it challenges long-standing assumptions about modern chemistry, experts are quick to note that this study has yet to be supported by or replicated in independent experiments that deliver the same, or similar, results. This means that more studies will have to be conducted to fully understand and validate the breakthrough this particular team has uncovered. This curious discovery implies that there might not be a lot of applications on Earth. Essentially, the results were derived from following altered scientific rules and very extreme conditions, which we wouldn’t naturally find on this planet. But environments similar to what was created in this experiment, like the center of gas giant planets like Jupiter and Saturn where helium abounds, provide a context for these reactions that offer insight into how chemistry works on other planets. It also raises a lot of questions about our understanding of chemistry. Our benchmark for chemical reactions is derived from our knowledge of this world. With the impending possibility of long-term space travel on the horizon, we have to be open to the fact that chemistry as we know it is not always the way that we know it. A Simple but Mind-Blowing Experiment: What Way Will the Balloon Travel?